According to Gerald Celente, if Germany is weak, so is the rest of the euro zone. If Germany is weak, that means China is weak because they are not importing products from Germany or other European countries. The other problem facing the world is the fact that interest rates are going to have to go higher and that means national debts will become unsustainable. In short, central planners can’t keep this Ponzi scheme going; thus, after preparing, keep stacking physical. The secret to China’s spectacular growth beginning in the early 1990s was devaluing its currency compared to the U.S. Dollar. Since 2006, the U.S. government has pursued weak-dollar policies by pushing interest rates down. China owns about one in every seven dollars of U.S. Treasury Bonds. By selling those bonds, the Chinese Yuan could be devalued more and help Chinese exports at the expense of the other countries. We are told that Ebola virus is spread by close contact with the bodily fluids of an infected person. So, how is it possible that more than 170 health workers have been infected by the Ebola virus? If it is spreading so easily among those who take extra precautions, just imagine as it has gone from patient zero to a pandemic in just 7 months. What is more interesting is that a criminal drug company, with a felony record, will manufacture and rush an Ebola vaccine to the market with near-zero safety testing. Out of the more than 7 billion people in the world, only 1.3 billion work full-time. That means that there are a whole lot of really poor, really desperate people that need to be employed. And what happens when robots can do everything better than us? Until the American people start understanding what has happened for decades, it will get worse. Over 40% of the gold leaving Switzerland is reportedly landing not in Russia, China, or even Germany. Instead, it has gone to India. Though India was recently replaced by China as the world’s largest consumer of gold, it is still a major consumer of bullion. India’s financial savings has been falling relative to its GDP, even as gold imports were steadily rising. The U.S. government had 5 trillion dollars in unbacked currency issued by deficit spending in the system in 2007; today it has 12.57 trillion dollars, or 2.5 times as much. There is this common belief that one can have a “free lunch” but that is false, At some point, no one is going to be able to borrow to keep the charade afloat and that is when it all crashes. 1. Retail sales have missed expectations for three months in a row. 2. The four week moving average for mortgage applications just hit a 14 year low. 3. 76% of Americans do not have enough money saved to cover six months of expenses. 4. The U.S. home-ownership rate has fallen to the lowest level since 1995. Unlike physical gold and silver, stocks, bonds, and other paper instruments are not stores of economic energy, but rather future energy IOU’s. When the market finally realizes the global energy supply is contracting, the perceptions of the future value of paper instruments will change abruptly and in a very negative way. 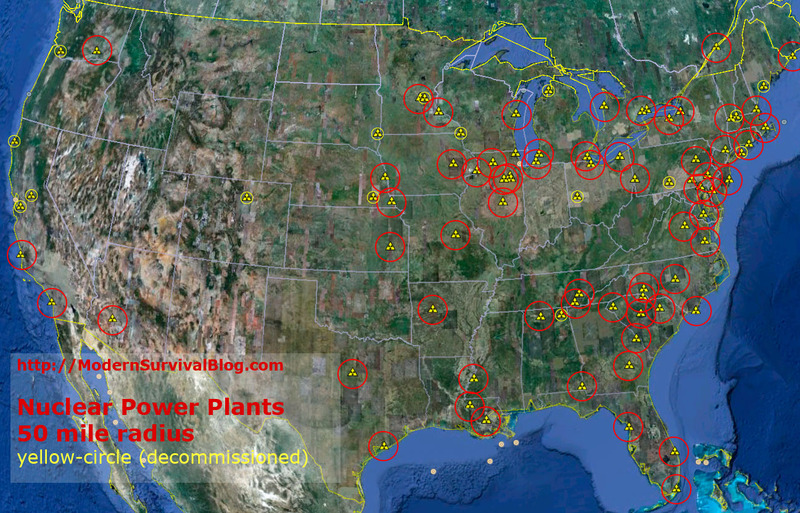 There is an interesting map of the U.S. where each of the nuclear power plants have a superimposed 50 mile radius circle around them. I’m personally glad I live well over a hundred miles away from any of those circles. They may be CIA-funded brutal cannibalistic savages; however, like Obama, when Al-Qaeda makes a mistake, they apologize. In the case of Al-Qaeda, they beheaded a fellow “rebel” by mistake. Did Al-Qaeda paraphrase Obama with “If you like your head, you can keep it” statement? At least Al-Qaeda is honest unlike two polls indicating the majority of Americans no longer trust Obama or believe he is being honest with them. Without the consent of Congress, Obama does not have the legal authority to change laws like he attempted to do with Obamawreck. Different “Fix-it” bills have been introduced in both houses of Congress. If “Fix-It” legislation became law, it would only increase the pain on Americans as insurance rates skyrocketed. It’s as nightmarish as a goblin shark with lipstick. The easy-to-understand, yet impossible to do, answer is to rescind Obamawreck completely and start all over without lawyers and ideologues. According to Chris Powell, who spoke to Asian central bankers, the Western scheme is nearing its end because they are running out of physical gold to continue it. Asian central bankers know that the West is essentially running a Ponzi scheme with regards to the Western gold market and they are taking advantage of the bargain basement price to “Hoover” all the physical gold they can. Are you among the 76% of Americans living paycheck to paycheck and/or wondering how your money is being spent? Well, so is the CIA since they are collecting global data on money transactions. So, instead of calling a certified CPA about your expenses, perhaps your friends, at the CIA, can help you with your spending. Techies, in Silicon Valley, have turned on Obama because of the NSA’s revelations. The U.S. cloud computing industry could lose as much as 180 billion dollars, by 2016, due to the spying disclosures. Many techies feel betrayed by Obama’s empty promise of ending the surveillance programs that have tripled since 2010. Companies, outed by Snowden, for actively betraying their customers, are allegedly trying to strengthen their security. A group in Geneva is trying to persuade the U.N. to outlaw ‘Killer Robots.’ Of course, this will work as well as nuclear proliferation did. In addition, anyone who believes the U.S. government would abide by this international law needs to change their medication.